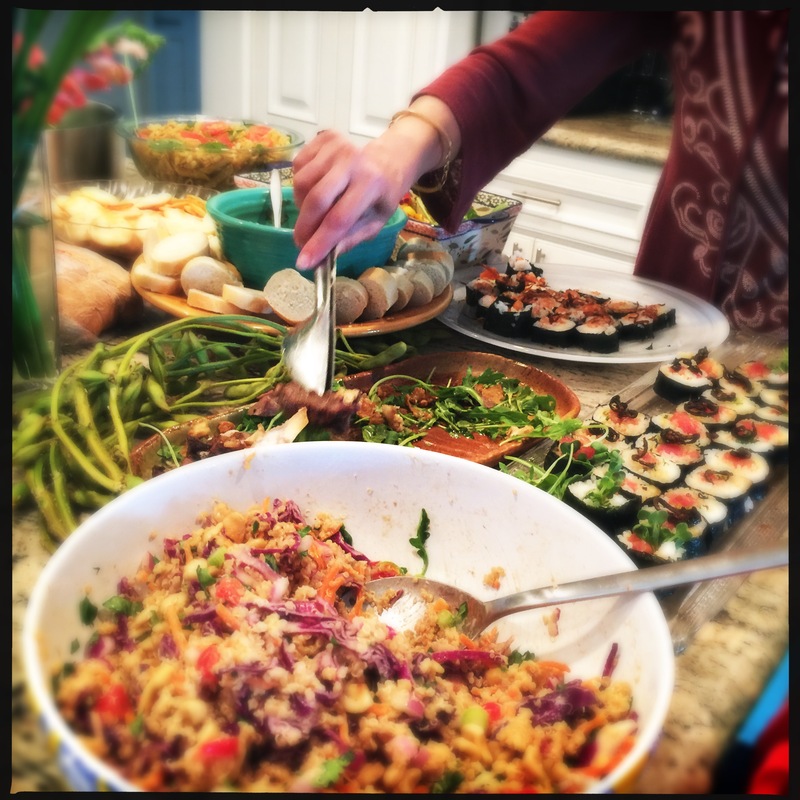 As you might guess, it is the “eating potluck” part of the equation that, every year around this time, sows fear in my soul. And, this being Topanga Canyon, there is one word in particular I expect to see a lot of in the emails leading up to the event: quinoa. “I’ll bring a quinoa salad!” one of the first enthusiastic parents responded to Simone’s email asking people to let her know what they would be bringing. This certainly would not be the only contribution containing quinoa. Perhaps someone would even venture forth with a quinoa loaf! Quinoa, for those new to my blog, plays the role of villain here. The grain itself is fairly innocuous, doesn’t really taste like much except maybe dirt, and I actually don’t even dislike it. Rather, it’s quinoa’s elevation into the holy realm of kombucha, kirtan, Lululemon and Frappucinos that I find distasteful. “I’ll be bringing secret food for us to hide in the kitchen,” I promised Casey, who gave me a thumbs up. And then I decided, along with the sushi rolls I was planning on bringing, to make a couple steaks just to offer a little yang to the quinoa’s yin. In the interest of full disclosure, I do keep quinoa in the pantry. It is quite healthy, and I find if you enough foils — cheese and roasted vegetables and torrents of olive oil and maybe even some strips of proscuitto — it can make a nice light and tasty lunch. The day before the event, I was wondering what to make for lunch. I had planned poutine with Swedish meatballs for dinner, so I decided it should probably be something healthy. And I saw the quinoa on the shelf. 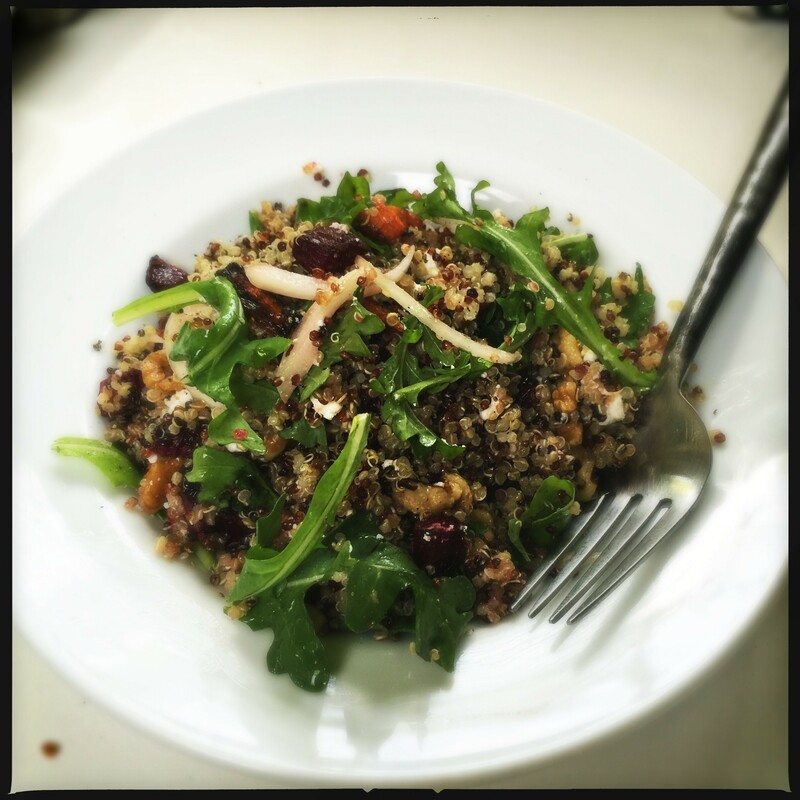 I realized with some trepidation that this is the second quinoa recipe on my blog. Just don’t expect to see me at any soul cycle classes anytime soon. Toss the cubed beets and carrots in 2 tbsp. olive oil on a piece of foil, and roast at 400 degrees for 10 minutes. Remove and let cool. Toss together quinoa, roasted veggies, tomato, walnuts, arugula, feta and vinegar with remaining olive oil. Scoop onto plates or into bowls, drizzle with a little additional olive oil, season to taste with salt and pepper, and serve. Well it sounds like the quinoa was at least smothered. Why don’t they put it in pill form? You had fun with it, right???? Have a great, safe Labor Day Weekend! Yes, indeed Cheryl. We had fun with it. The tequila helped — it always does. 😉 Have a great weekend. Throw a conch on the grill for me. I’m surprised it was around in anyone’s youth (except Peruvians) — I thought it was a relatively newish thing to us gringos. 🙂 I would probably pronounce it “quin-ughh-ahhh”, but I like “to hell with it” better. What no farro, kale, coconut water, goji berries? Says she who should eat some quinoa tomorrow since I just made a ton of red velvet cupcakes (yes, they are flying in Germany) and black chocolate-espresso cake with Single Malt Whisky glaze for the other half. Sean’s trenchant observations and the humorous repartee that ensued just made me laugh out loud. At the carwash. Egad. For the record, I like that keen-wah stuff, but have no objection to laughing at it, goji berries, coconut water, etc. But WTH is kirtan?? It’s where white people pretend they’re from India and sit in the lotus position and chant. It’s kinda like those drum circles you have in Venice, where white people sit in circles with African hand drums and pretend they have rhythm.